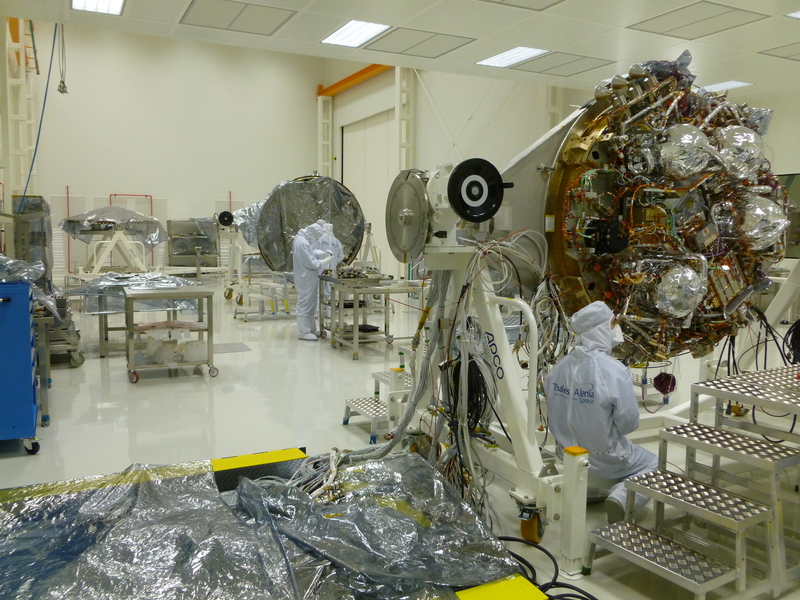 The ExoMars 2016 entry, descent and landing module, known as Schiaparelli, was assembled in a dedicated Biological Contamination Controlled Clean Room that was established at the Thales Alenia Space (Italy) premises by the ExoMars project. Since Schiaparelli will land on Mars – a planet with potential for past or present life – stringent planetary protection requirements must be obeyed, in particular with respect to microbiological contamination. To achieve this, the module was assembled in a controlled environment at Turin (pictured here), and any activities that were carried out on the open module during the integration and testing phase at Thales Alenia Space (France) or at the launch site in Baikonur, were done within a portable clean tent. Samples of the air and surfaces were taken regularly and the levels of microbiological activity monitored to ensure that the module remained at all times within the strict limits that have been set by the Committee on Space Research (COSPAR). For further details about planetary protection aspects of the ExoMars programme, see the interview with ESA's planetary protection officer, Gerhard Kminek.